"Cry" redirects here. For other uses, see Cry (disambiguation). This article is about the human shedding of tears. For other uses, see Crying (disambiguation). Crying is the shedding of tears (or welling of tears in the eyes) in response to an emotional state, pain or a physical irritation of the eye. Emotions that can lead to crying include anger, happiness, or sadness. The act of crying has been defined as "a complex secretomotor phenomenon characterized by the shedding of tears from the lacrimal apparatus, without any irritation of the ocular structures", instead, giving a relief which protects from conjunctivitis. A related medical term is lacrimation, which also refers to non-emotional shedding of tears. Various forms of crying are known as sobbing, weeping, wailing, whimpering, bawling, and blubbering. For crying to be described as sobbing, it usually has to be accompanied by a set of other symptoms, such as slow but erratic inhalation, occasional instances of breath holding and muscular tremor. A neuronal connection between the lacrimal gland (tear duct) and the areas of the human brain involved with emotion has been established. Scientists debate over whether humans are the only animals that produce tears in response to emotional states. Charles Darwin wrote in The Expression of the Emotions in Man and Animals that the keepers of Indian elephants in the London Zoo told him that their charges shed tears in sorrow. Tears produced during emotional crying have a chemical composition which differs from other types of tears. They contain significantly greater quantities of the hormones prolactin, adrenocorticotropic hormone, and Leu-enkephalin, and the elements potassium and manganese. Two women weep at a funeral. The question of the function or origin of emotional tears remains open. Theories range from the simple, such as response to inflicted pain, to the more complex, including nonverbal communication in order to elicit altruistic behavior from others. Some have also claimed that crying can serve several biochemical purposes, such as relieving stress. Crying is believed to be an outlet or a result of a burst of intense emotional sensations, such as agony, surprise or joy. This theory could explain why people cry during cheerful events, as well as very painful events. Individuals tend to remember the positive aspects of crying, and may create a link between other simultaneous positive events, such as resolving feelings of grief. Together, these features of memory reinforce the idea that crying helped the individual. William H. Frey II, a biochemist at the University of Minnesota, proposed that people feel "better" after crying due to the elimination of hormones associated with stress, specifically adrenocorticotropic hormone. This, paired with increased mucosal secretion during crying, could lead to a theory that crying is a mechanism developed in humans to dispose of this stress hormone when levels grow too high. However, tears have a limited ability to eliminate chemicals, reducing the likelihood of this theory. Emotional tears have also been put into an evolutionary context. One study proposes that crying, by blurring vision, can handicap aggressive or defensive actions, and may function as a reliable signal of appeasement, need, or attachment. Oren Hasson, an evolutionary psychologist in the zoology department at Tel Aviv University believes that crying shows vulnerability and submission to an attacker, solicits sympathy and aid from bystanders, and signals shared emotional attachments. Another theory that follows evolutionary psychology is given by Paul D. MacLean, who suggests that the vocal part of crying was used first as a "separation cry" to help reunite parents and offspring. The tears, he speculates, are a result of a link between the development of the cerebrum and the discovery of fire. MacLean figures that since early humans must have relied heavily on fire, their eyes were frequently producing reflexive tears in response to the smoke. As humans evolved the smoke possibly gained a strong association with the loss of life and, therefore, sorrow. More recently, CVBellieni analysed the weeping behavior, and concluded that most animals can cry but only humans have psychoemotional shedding of tears, also known as “weeping”. Weeping is a behavior that induces empathy perhaps with the mediation of the mirror neurons network, and influences the mood through the release of hormones elicited by the massage effect made by the tears on the cheeks, or through the relief of the sobbing rhythm. The most common side effect of crying is feeling a lump in the throat of the crier, otherwise known as a globus sensation. Although many things can cause a globus sensation, the one experienced in crying is a response to the stress experienced by the sympathetic nervous system. When an animal is threatened by some form of danger, the sympathetic nervous system triggers several processes to allow the animal to fight or flee. This includes shutting down unnecessary body functions, such as digestion, and increasing blood flow and oxygen to necessary muscles. When an individual experiences emotions such as sorrow, the sympathetic nervous system still responds in this way. Another function increased by the sympathetic nervous system is breathing, which includes opening the throat in order to increase air flow. This is done by expanding the glottis, which allows more air to pass through. As an individual is undergoing this sympathetic response, eventually the parasympathetic nervous system attempts to undo the response by decreasing high stress activities and increasing recuperative processes, which includes running digestion. This involves swallowing, a process which requires closing the fully expanded glottis to prevent food from entering the larynx. The glottis, however, attempts to remain open as an individual cries. This fight to close the glottis creates a sensation that feels like a lump in the individual's throat. Other common side effects of crying are quivering lips, a runny nose, and an unsteady, cracking voice. According to the German Society of Ophthalmology, which has collated different scientific studies on crying, the average woman cries between 30 and 64 times a year, and the average man cries between 6 and 17 times a year. Men tend to cry for between two and four minutes, and women cry for about six minutes. Crying turns into sobbing for women in 65% of cases, compared to just 6% for men. Until adolescence, however, no difference between the sexes was found. Although crying is an infant's mode of communication, it is not limited to a monotonous sound. There are three different types of cries apparent in infants. The first of these three is a basic cry, which is a systematic cry with a pattern of crying and silence. The basic cry starts with a cry coupled with a briefer silence, which is followed by a short high-pitched inspiratory whistle. Then, there is a brief silence followed by another cry. Hunger is a main stimulant of the basic cry. An anger cry is much like the basic cry; however, in this cry, more excess air is forced through the vocal cords, making it a louder, more abrupt cry. This type of cry is characterized by the same temporal sequence as the basic pattern but distinguished by differences in the length of the various phase components. The third cry is the pain cry, which, unlike the other two, has no preliminary moaning. The pain cry is one loud cry, followed by a period of breath holding. Most adults can determine whether an infant's cries signify anger or pain. 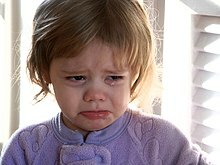 Most parents also have a better ability to distinguish their own infant's cries than those of a different child. A 2009 study found that babies mimic their parents' pitch contour. French infants wail on a rising note while German infants favor a falling melody. Carlo Bellieni found a correlation between the features of babies' crying and the level of pain, though he found no direct correlation between the cause of crying and its characteristics. T. Berry Brazelton has suggested that overstimulation may be a contributing factor to infant crying and that periods of active crying might serve the purpose of discharging overstimulation and helping the baby’s nervous system regain homeostasis. Sheila Kitzinger found a correlation between the mother's prenatal stress level and later amount of crying by the infant. She also found a correlation between birth trauma and crying. Mothers who had experienced obstetrical interventions or who were made to feel powerless during birth had babies who cried more than other babies. Rather than try one remedy after another to stop this crying, she suggested that mothers hold their babies and allow the crying to run its course. Other studies have supported Kitzinger's findings. Babies who had experienced birth complications had longer crying spells at three months of age and awakened more frequently at night crying. Based on these various findings, Aletha Solter has proposed a general emotional release theory of infant crying. When infants cry for no obvious reason after all other causes (such as hunger or pain) are ruled out, she suggests that the crying may signify a beneficial stress-release mechanism. She recommends the "crying-in-arms" approach as a way to comfort these infants. Another way of comforting and calming the baby is to mimics the familiarity and coziness of mother’s womb. Dr. Robert Hamilton developed a technique to parents where a baby can be calmed and stop crying in 5 seconds. There have been many attempts to differentiate between the two distinct types of crying: positive and negative. Different perspectives have been broken down into three dimensions to examine the emotions being felt and also to grasp the contrast between the two types. Spatial perspective explains sad crying as reaching out to be "there", such as at home or with a person who may have just died. In contrast, joyful crying is acknowledging being "here." It emphasized the intense awareness of one's location, such as at a relative's wedding. The last dimension is known as the public-private perspective. This describes the two types of crying as ways to imply details about the self as known privately or one's public identity. For example, crying due to a loss is a message to the outside world that pleads for help with coping with internal sufferings. Or, as Arthur Schopenhauer suggested, sorrowful crying is a method of self-pity or self-regard, a way one comforts oneself. Joyful crying, in contrast, is in recognition of beauty, glory, or wonderfulness. 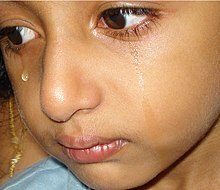 In Orthodox and Catholic Christianity, tears are considered to be a sign of genuine repentance, and a desirable thing in many cases. Tears of true contrition are thought to be sacramental, helpful in forgiving sins, in that they recall the Baptism of the penitent. There are three types of tears: basal tears, reflexive tears, and psychic tears. Basal tears are produced at a rate of about 1 to 2 microliters a minute, and are made in order to keep the eye lubricated and smooth out irregularities in the cornea. Reflexive tears are tears that are made in response to irritants to the eye, such as when chopping onions or getting poked in the eye. Psychic tears are produced by the lacrimal system and are the tears expelled during emotional states. The lacrimal system is made up of a secretory system, which produces tears, and an excretory system, which drains the tears. The lacrimal gland is primarily responsible for producing emotional or reflexive tears. As tears are produced, some fluid evaporates between blinks, and some is drained through the lacrimal punctum. The tears that are drained through the punctum will eventually be drained through the nose. Any excess fluid that did not go into the punctum will fall over the eyelid, which produces tears that are cried. Baby colic, where an infant's excessive crying has no obvious cause or underlying medical disorder. Familial dysautonomia, where there can be a lack of overflow tears (alacrima), during emotional crying. Pathological laughing and crying, where the patients experience uncontrollable episodes of laughing, crying, or in some cases both. ^ Patel, V. (1993). "Crying behavior and psychiatric disorder in adults: a review". Compr Psychiatry. 34 (3): 206–11. doi:10.1016/0010-440X(93)90049-A. PMID 8339540. Quoted by Michelle C.P. Hendriks, A.J.J.M. Vingerhoets in Crying: is it beneficial for one's well-being? ^ "List of 426 Sets of Synonyms and How they Differ in Meaning". Paulnoll.com. Retrieved 2014-08-04. ^ a b Walter, Chip (December 2006). "Why do we cry?". Scientific American Mind. 17 (6): 44. ^ Langseth, Muriel; Frey, William H. (1985). "Ch. 14: Do Animals Shed Emotional Tears?". Crying: the mystery of tears. Minneapolis, Minn: Winston Press. pp. 135–9. ISBN 0-86683-829-5. ^ "On the Origin of Crying and Tears". Human Ethology Newsletter. 5 (10): 5–6. June 1989. ^ Doheny, Kathleen. "Why We Cry: The Truth About Tearing Up". WebMD. Retrieved 23 June 2011. ^ Carey, Benedict (2 February 2009). "The Muddled Tracks of All Those Tears". The New York Times. The New York Times. Retrieved 18 July 2011. ^ "Emotional Freedom". Retrieved 30 January 2015. ^ Juan Murube, president of the Spanish Society of Ophthalmology, reports that the amount of blood passing through the lacrimal glands is tiny in comparison to the body's five liters of blood, and unlike other minor bodily excretion methods like breathing and perspiration, tears are mostly reabsorbed into the body. "Origin and types of emotional tearing" (PDF). Retrieved 20 March 2017. ^ Miceli, M.; Castelfranchi, C. (2003). "Crying: discussing its basic reasons and uses". New Ideas in Psychology. 21 (3): 247–73. doi:10.1016/j.newideapsych.2003.09.001. ^ "Why Cry? Evolutionary Biologists Show Crying Can Strengthen Relationships". Science Daily. Tel Aviv University. Retrieved 8 September 2011. ^ Lutz, Tom (1999). Crying : the natural and cultural history of tears (1. ed.). New York: W. W. Norton. pp. 90–91. ISBN 0-393-04756-3. ^ Bellieni CV (2017). "Meaning and importance of weeping". New Ideas in Psychology. ^ "Cry Me A River: The Psychology of Crying". Science Daily. Association for :Psychological Science. 19 December 2008. Retrieved 18 July 2011. ^ "What Causes a Lump in the Throat Feeling? Globus Sensation". Heath Talk. Retrieved 18 July 2011. ^ Glass, Don (15 January 2007). "A Lump in Your Throat". Moment of Science. ^ Onken, Michael (16 February 1997). "What causes the 'lump' in your throat when you cry?". MadSci. Washington University Medical School. Retrieved 18 July 2011. ^ a b "Frauen und Männer weinen anders [German: Woman and Men Cry Differently]" (PDF). Pressearchiv 2009. Deutsche Ophtalmologische Gesellschaft. October 2009. Retrieved 19 January 2015. ^ "Women cry more than men, and for longer, study finds". The Telegraph. London. 15 October 2009. ^ Zeskind, P. S.; Klein, L.; Marshall, T. R. (Nov 1992). "Adults' perceptions of experimental modifications of durations of pauses and expiratory sounds in infant crying". Developmental Psychology. 28 (6): 1153–1162. doi:10.1037/0012-1649.28.6.1153. Retrieved 5 November 2013. ^ Santrock, John W. (2007). "Crying". A Topical Approach to Lifespan Development (4th ed.). McGraw-Hill Humanities/Social Sciences/Languages. pp. 351–2. ISBN 0-07-338264-7. ^ Mampe, B.; Friederici, A.D.; Christophe, A.; Wermke, K. (December 2009). "Newborns' cry melody is shaped by their native language". Curr. Biol. 19 (23): 1994–7. doi:10.1016/j.cub.2009.09.064. PMID 19896378. ^ Bellieni CV, Sisto R, Cordelli DM, Buonocore G. Cry features reflect pain intensity in term newborns: an alarm threshold. Pediatr Res. 2004 Jan;55(1):142-6. ^ Brazelton, T.B. (1985). "Application of cry research to clinical perspectives." In B.M. Lester and C.F.Z. Boukydis (Eds. ), Infant Crying: Theoretical and Research Perspectives. New York: Plenum Press. ^ Brazelton, T.B. (1992). Touchpoints. New York: Perseus. ^ Kitzinger, S. (1989). The Crying Baby. New York: Viking. ^ de Weerth, C. & Buitelaar, J.K. (2007). "Childbirth complications affect young infants' behavior." European Child and Adolescent Psychiatry, 16 (6): 379–388. ^ Keller, H., Lohaus, A., Volker, S., Cappenberg, M. & Chasiotis, A. (1998). "Relationships between infant crying, birth complications, and maternal variables." Child: Care, Health and Development, 24 (5): 377–394. ^ Solter, A. (1995). "Why do babies cry?" Pre- and Perinatal Psychology Journal, 10 (1), 21–43. ^ Solter, A. (1998). Tears and Tantrums: What to Do When Babies and Children Cry. Goleta, CA: Shining Star Press. ^ Solter, A. (2004). Crying for comfort: distressed babies need to be held." Mothering, Issue 122 January/February, 24–29. ^ "How To Calm A Crying Baby Tips for Parents and Babysitters". NannySOS. Retrieved 23 December 2016. ^ a b c d Katz, Jack (1999). How emotions work. Chicago [u.a. ]: Univ. of Chicago Press. p. 182. ISBN 0-226-42599-1. ^ Design by (2014-06-18). "On Prayer XVII: On Compunction and Tears | A Russian Orthodox Church Website". Pravmir.com. Retrieved 2017-06-02. ^ "Crying". Nytimes.com. 1992-03-10. Retrieved 2017-06-02. ^ Lutz, Tom (1999). Crying : the natural and cultural history of tears (1. ed.). New York: W. W. Norton. p. 68. ISBN 0-393-04756-3. ^ Lutz, Tom (1999). Crying : the natural and cultural history of tears (1. ed.). New York: W. W. Norton. pp. 69–70. ISBN 0-393-04756-3. ^ Morais Pérez, D.; Dalmau Galofre, J.; Bernat Gili, A.; Ayerbe Torrero, V. (1990). "[Crocodile tears syndrome]". Acta Otorrinolaringol Esp (in Spanish). 41 (3): 175–7. PMID 2261223. ^ Felicia B. Axelrod; Gabrielle Gold-von Simson (October 3, 2007). "Hereditary sensory and autonomic neuropathies: types II, III, and IV". Orphanet Journal of Rare Diseases. 2 (39): 39. doi:10.1186/1750-1172-2-39. PMC 2098750. PMID 17915006. Walter, Chip (December 2006). "Why do we cry?". Scientific American Mind. 17 (6): 44. 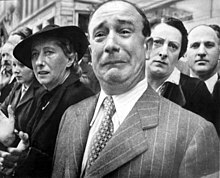 Wikimedia Commons has media related to Crying. Damian Corless (8 August 2008). "Boys don't cry?". Irish Independent. : examines the taboo that still surrounds public crying. John-Paul Flintoff (30 August 2003). "Why we cry". Melbourne: The Age. Gina Stepp (14 January 2009). "It's No Party, But I'll Cry if I Want To". Vision Media.